Holiday festivities are the perfect time to go all out glamour with your look. And what better way to make a stylish statement than to accent your pout with a bold (but tasteful!) red lipstick. Don’t be afraid, there is a great red for all ages and every skin tone. 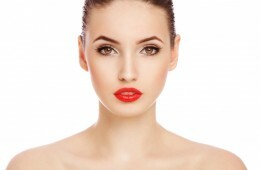 Here are a few tips about rocking red lips! Step 1. Prime Your Lips. If lip edges are flattening or creases are starting to appear along the edges, try Juvéderm to fill out wrinkles and restore a youthful pout. A little Juvéderm goes a long way to rejuvenate your lips. And if your lips are thin or unbalanced, Juvéderm can help plump and improve balance and symmetry. Use a lip balm or conditioner on your lips to moisturize and remove any dry flakes. Step 2. Determine Your Skin Tone. To find the most flattering red to complement your skin and teeth, determine whether your skin has warm or cool undertones. Place a sheet of white paper next to your forearm, is your skin more yellow (warm) or pink or blue (cool). Do your veins look greenish (warm) or blue (cool)? If you have warm undertones or olive skin pick a red that has a more coral or orangey cast, if you are cool or pink/fair, then choose a blue-based red that is more cherry, or berry influenced. Dark skin can look great with deeper shades in berry or brick. Neutral or true reds will generally work for any skin tone. Step 3. Tips on carrying it off. After conditioning your lips, line with an exact or similar shade creamy lip pencil at or just inside the border of your lip. Do not line outside of your natural border! Lightly fill in. Apply lip color with a brush or straight from the tube. If desired apply a clear or colored gloss to the center of the lower lip. Press lips together and blot where lips touch. If desired, use a touch of concealer around the lip edge on a flat liner brush to crisp up the outline and discourage feathering.